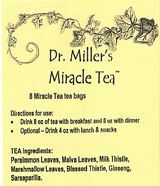 Doctor Miller has formulated a new tea called "Miracle Tea". Miracle Tea™ is similar to Dr. Miller's patented Holy Tea™ but a little stronger. While similar, it has added ingredients of Sarsaparilla and Ginseng. Doctor Miller’s Miracle Tea™ is not a drug, nor intended to diagnose, treat or cure any disease or illness. You should consult with your physician before starting this or any other cleansing exercise or weight management program. Miracle Tea™, formulated by Bill Miller, Ph. D., is a unique blend of all natural ingredients which has been used with great results for over 20 years. Miracle Tea™ may be used by persons who suffer with Acid Reflux, Constipation, Indigestion, Bloating, Excess Gas and Belching. Miracle Tea™ may be used by persons who would like to Detox Chemicals, Take inches off your stomach, Clean out Nicotine & Secondhand Smoke, Keep Liver, Lungs and Colon Healthy and Clean, Help Spastic Colon Parasites, Bacteria and Toxins from their entire Digestive System. Holy Tea may also be used as an element of a Weight Loss Program. With continued use of Miracle Tea™, one may experience clearer, healthier, younger looking skin, increased energy and a happier outlook!